No repainting. No Bondo. We don't sell your information to Carfax! Get your dings fixed today! 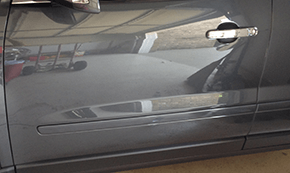 Coin-sized dents or "door-dings" can quickly and discreetly be repaired at your home or office while you go about your day. 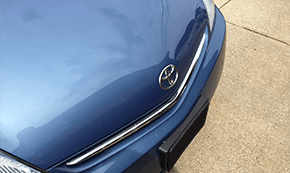 Dents Vanish discretely removes unsightly dings and dents at your home or place of business in a matter of minutes! Retain the factory manufacturer's finish. No painting, no Bondo. The superior process to a body shop repair. Lifetime Guaranteed! 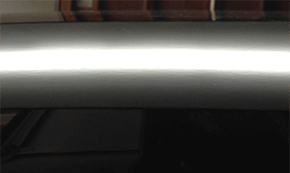 Crease dents required a highly skilled technician to repair properly. Dents Vanish technicians have many years of quality experience and the skill to make them vanish. Don't settle for inferior repairs at a lower cost. Dents Vanish will remove your crease dents to pre-damage condition guaranteed! Large dent repair is in a class by itself. 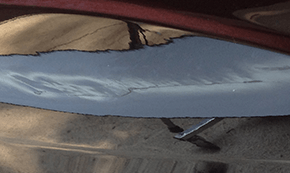 Dents Vanish has many years of large dent repair experience and training to properly restore your vehicle to pre-damage condition, guaranteed! Dents the size of a basketball and larger are what Dents Vanish specializes in. Call us first before deciding on a body shop repair. 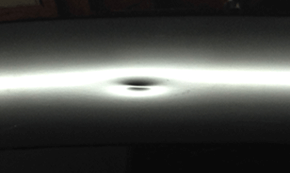 Crease dents are characterized by being larger than they are wide. Creases are inherently more difficult to repair and vary by sharpness and depth at the bottom. Allow one of our highly skilled dent experts to restore your vehicle to pre-damage condition today! 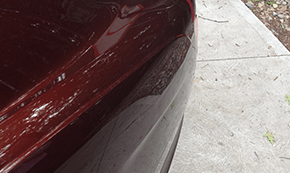 Larger dents, typically over 2 inches in diameter and bigger, depending on the amount of stretched metal, can be restored to pre-damaged condition without the need for body filler (a.k.a.) or paint work. Eliminate the Carfax. Keep your factory paint intact along with the warranty. No diminished value at resale time. Call us today! We make dents vanish. 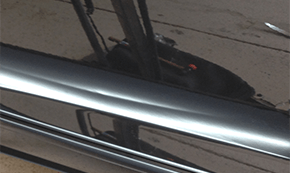 Dents Vanish is a premiere dent removal service for northeast Ohio. Dings, dents, pings, creases, and large dents are discretely removed by our expert technicians on site while you go about your day. Why go to the body shop where you will need to leave your vehicle for days on end and deal with the hassle of rental vehicles or asking for a ride? Dents Vanish removes your dents without the need to use body filler (a.k.a. Bondo) or applying aftermarket paint to your vehicle. We've honed our craft for over a decade and while big name companies such as Dent Wizard have been around longer, our sole focus is on the individual retail customer. Dents Vanish does not chase large volume wholesale accounts that are perfectly ok with mediocre quality like most large corporate dent companies. 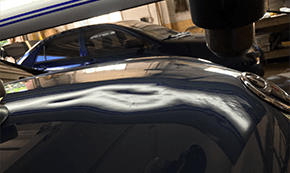 While other dent repair companies may offer lower priced repairs, almost always sacrificing quality, Dents Vanish never compromises the quality of the art we perform, that's why all of our repairs are backed by a lifetime guarantee on all workmanship performed. Choosing Dents Vanish means your factory paint warranty remains intact and we never sell your repair information to companies such as Carfax, which means the information won't be used against you at resale time. Call Dents Vanish today to schedule a superior repair. Don't fall victim to low priced quotes. This is what too many vehicle owners have been left with after purchasing service through an alleged pdr company claiming to perform quality services. Repairing this hood properly after a competitor failed miserably cost this customer double what our quote was for the original dent. DON'T be fooled. This mangled mess was created by a local dent company in northeast Ohio that claimed their low price of $75 would remove the dent. Dents Vanish was called to try and salvage this scam artist's mess. The actual repair took three times as long to complete due to all of the poke marks and stretched metal. DON'T be fooled!